Fuses and fusible links are electrical circuit overload protection devices. 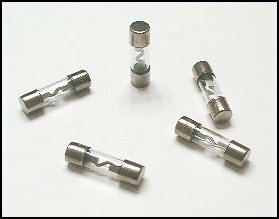 Fuses contain a soft metal which melts when current flow capacity is exceeded. The amperage in which the fuse will fail is determined by the thickness of the metal material in the fuse. Fuses should only be replaced with a similar capacity fuse. Fusible links are circuit protection devices in the form of a small section of wire. If higher amperage circuit were to use 12 gauge wiring, a small section of 16 gauge wiring, called the fusible link, would be placed in that circuit. If the circuit were to become overloaded, the fusible link would melt and fail before the larger wiring in the circuit. The open circuit caused by the burned fusible link would stop current flow, thus providing protection to the circuit. 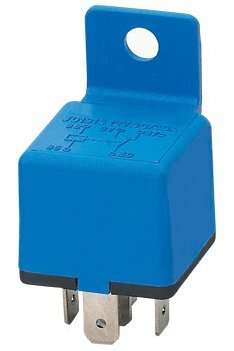 Relays are used to remotely control high current circuits. They allow a small current flow to control a high current load device. A relay contains a coil that controls a set of contacts. A control circuit will flow current through the coil causing it to become a magnet. The action of the magnet will draw two contacts together, allowing current to flow to a device. Relays may contain internal protection devices to prevent damage to controlling devices by voltage induced by the collapsing magnetic field, when the circuit is turned off. This usually is an internal diode that allows the magnetic field to collapse within the relay coils and not through a controlling component. 6 Comments on "Fuses Relays"
Will an automotive fuse link show signs of burning out on the insulation? I need to find a “hard coated” 30AMP automotive fuse. What is the difference between that and a regular 30AMP auto fuse? My blinkers will turn on and then quit blinking all of the sudden. sometimes when this happens it will come back on before I have finished my turn. what could this be?